Job seekers are reporting age discrimination beginning as early as the mid-thirties. In fact, in some industries, you're considered to be washed up" by the time you reach your forties. But what can you do when you're considered to be too old to be hired? How do you fight age discrimination in the workplace? For a start, there are laws that prohibit employment discrimination because of age. In addition, there are a few strategies you can use to help mitigate age discrimination issues. Employment discrimination happens when a job seeker or an employee is treated unfavorably because of his or her race, skin color, national origin, gender, gender identity, disability, religion, sexual orientation, or age. What is the “gray ceiling” and why does it matter? The gray ceiling is a term used to describe the age discrimination that many older job seekers and employees face while they’re searching for jobs or seeking promotions. Even though employers aren’t supposed to discriminate based on how old you are, getting hired can be a challenge when you’re considered to be an “older” worker. And you don't need to have gray hair to be considered too old to get hired. When the House of Representatives voted unanimously to repeal the Social Security earnings cap in an amendment to the 2000 “Senior Citizens’ Freedom To Work Act,” their rationale was that removing the previous earnings limit would enable more older Americans to return to work. About 18.8% of people over the age of 65 worked in 2016, according to the Pew Research Council. The National Council on Aging reports that, by 2019, over 40% of people over the age of 55 are expected to be working. This will constitute 25% of the U.S. labor force. 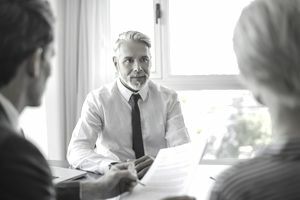 In addition to being considered "old," experienced candidates are sometimes considered to be more of an expense (higher salary, pension, benefits costs, etc.) than a younger applicant would be. Workers over the age of 45 are unemployed longer than younger workers. By 2024, the number of employees over 55 years of age will reach 41 million, compared to 27 million in 2008. More older workers are considering postponing retirement and continuing to work. However, research has found no relationship between age and job performance. Just because you’re older doesn’t mean you’re better or worse than younger workers. If you believe you have been discriminated against because of your age, there are protections provided by age discrimination law. The Age Discrimination in Employment Act of 1967 (ADEA) protects employees 40 years of age and older from discrimination on the basis of age in hiring, promotion, discharge, compensation, or terms, conditions or privileges of employment. The ADEA applies to employers with 20 or more employees, labor organizations with more than 25 members, employment agencies, and federal, state, and local governments. It does not apply to independent contractors or military personnel. This federal law is enforced by the Equal Employment Opportunity Commission (EEOC). However, a 2019 court ruling determined that the ADEA does not apply to job applicants. It remains to be seen if this decision will be appealed or if Congress will enact any further legislation clarifying the issue. The language to date on the EEOC website still refers to protections for job applicants. Each state has its own laws providing protection for older workers. These may provide stronger protections for older workers than the federal law. Such laws often apply to most or all employers, and not just those with 20 or more employees. Consult your state’s department of labor for information about laws in your location. Many employers have policies in place prohibiting hiring managers from advertising jobs in a way that would weigh against older candidates or practicing any form of age discrimination. The Society for Human Resource Management (SHRM), the preeminent professional organization in the field, recommends hiring the best candidate for the job regardless of age in its guidance to members. After reviewing any state laws regarding age discrimination, candidates who suspect discrimination should consult an HR professional, particularly someone charged with diversity compliance at the company, to see if they have a policy related to age discrimination. Be aware that the ADEA prohibits advertising that a certain age is preferred for a position, limiting training to younger workers, and in most cases requiring retirement at a specific age. Any individual who believes that his or her employment rights have been violated may file a charge of discrimination with the EEOC. Here’s how: Filing a Charge of Employment Discrimination. What options are there for those potential employees who are considered "old" by hiring managers and companies? How can you address the perception that older workers are not as capable or as qualified as their younger counterparts? There are strategies older job seekers can implement to help expedite a job search, and to find gainful and meaningful employment. For the older applicant, it’s especially important to utilize the available resources for finding attractive positions, as well as to be aware of the online protocols for applying for a position. For example, here are tips for job searching and writing resumes and cover letters specifically tailored to older job seekers. When you write your resume, limit your experience to 15 years for a managerial job, 10 years for a technical job, and five years for a high-tech job. Leave your other experience off your resume or list it without dates in an “Other Experience” category. Consider using a functional resume rather than a chronological resume. In addition, it would help to review these job searching tips for older workers. Plus, you can take a look at some resume tips for older job seekers along with a few cover letter tips for older job seekers as well. Project yourself as cheerful and flexible and back that up with proof of your skills and successes. Review the benefits of older workers—commitment to a career, hands-on experience, a track record of success, stable and realistic expectations—and think about how they apply to you. Use storytelling techniques to back up your claims to these skills. Relate examples of hard work, extra hours devoted to a job, and physically demanding outside interests that demonstrate vitality. Exude energy and enthusiasm in your verbal and non-verbal communication. Finally, review these job interview tips for older job seekers. Let potential employers know that you are flexible. Even though you may have earned six figures per year in the past, perhaps you no longer need that much, or maybe you’re willing to accept a lower salary to get your foot in the door. If that's the case and salary requirements are expected to be included in your cover letter, mention that your salary requirements are flexible or negotiable based upon the position and the entire compensation package, including benefits.